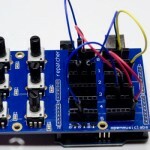 This fully assembled rePatcher shield interfaces with MAX/MSP and Pure Data via your Arduino. It has 6 continuous control knobs, and a 6 x 6 patchbay matrix to reroute data within your patch. Get lost in a maze of wires like your analog forebears! Does NOT come with Arduino, which is required for operation. - 1 Fully assembled rePatcher Shield & 10 Patch Cables. A pack of 10, 4″ Male to Male mini patch cables (jumper wires) in assorted colors. A good rule of thumb for patch cables: you will always need one more than you currently have! - 10 rePatcher Cables (assorted colors).